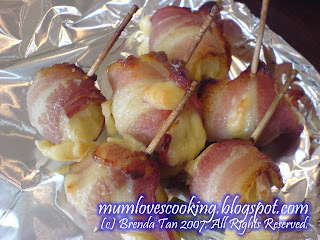 This is certainly an easy-to-make finger food that can be made in advance. All it requires to be ready is to be popped into the oven and heated up before serving. 1. Boil Quails' Eggs so that they become hard boiled. Shell the eggs and put them aside. 2. Slice the cucumbers thick, then cut them into half. The cucumbers are meant to act as a base to hold the skewered bacon roll in place. 3. Slice the Cheddar Cheese, and cut the slices about the size of the egg. 6. 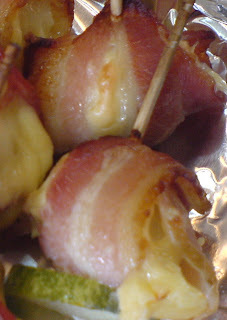 When required, put the bacon wrap into the oven at 200 deg C for about 10 to 15 minutes, or until the bacon sizzles and the cheese melts. But it's a party, and it's a treat. A healthier version of the bacon roll would be the cocktail sausages. 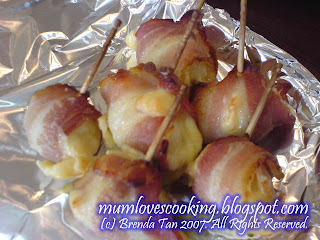 This is another finger food item that can be made in advance of parties since it's served cold. 1. Cut cucumber into small cubes, removing the seeds. 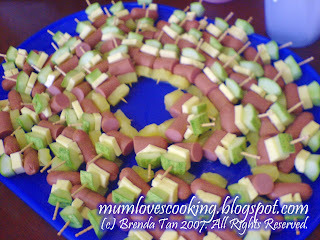 Likewise, cut the cheese and pineapple slices about the same size of the cucumber. 2. Skewer the ingredients together with a toothpick.